Finnish Death Metal Maniacs Fest 2017 will take place in Annis, Pori, Finland on June 2-3, 2017. 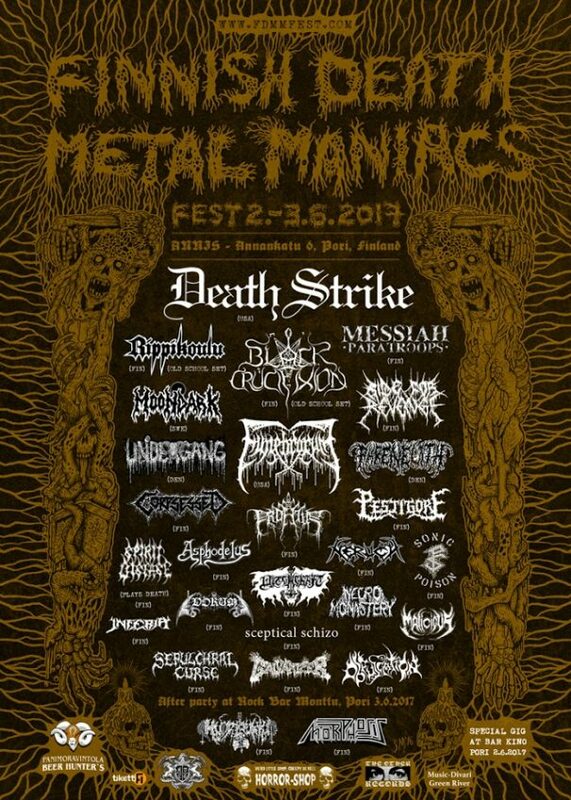 Beherit, Death Strike and Black Crucifixion are among the bands that will perform at Finnish Death Metal Maniacs Fest 2017. Obscene Extreme 2017 will take place in Trutnov, Czech Republic on July 5-9, 2017. 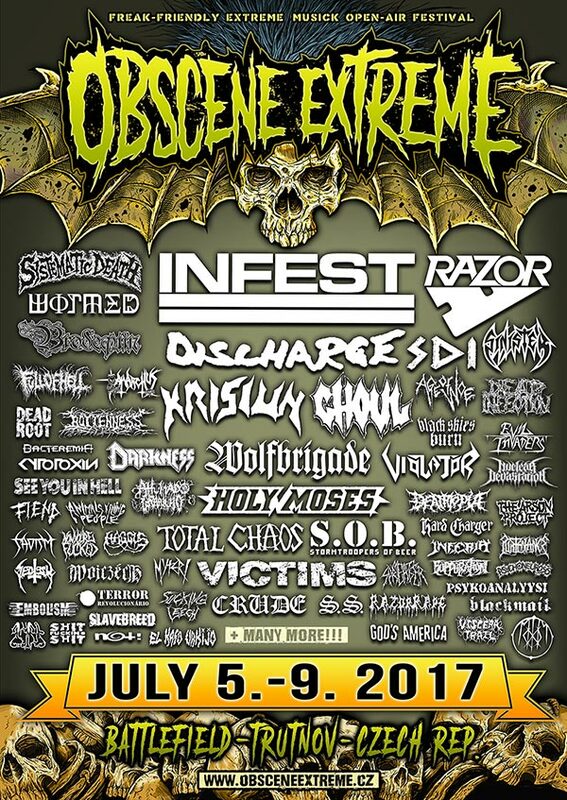 Infest, Discharge and Razor are among the bands that will perform at Obscene Extreme 2017 festival. 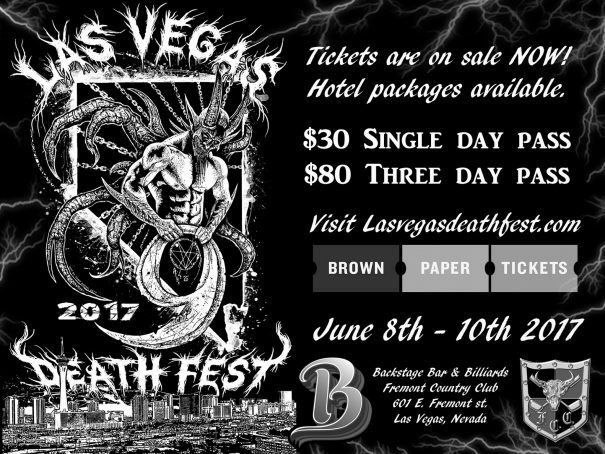 Las Vegas Deathfest 2017 will take place at Backstage Bar & Billiards and Fremont Country Club in Las Vegas, USA on June 8-10, 2017. Vader, Mortician and Angelcorpse are among the bands that will perform at Las Vegas Deathfest 2017 festival. Full Terror Assault 2015 will take place at Cave In Rock, Illinios, USA on September 10-12, 2015. Obituary, Napalm Death and Terrorizer are among the bands that will perform at the Full Terror Assault 2015 festival. Eisenwahn Festival will take place at Moto-Cross Racetrack, Obersinn, Germany on July 27-28, 2012. Kataklysm, Decapitated and Origin are among the bands that will perform at the Eisenwahn Festival 2012 festival.l. Tuska will take place in Suvilahti, Helsinki, Finland on June 29 – July 1, 2012. Megadeth, Lamb of God and Saint Vitus are among the bands that will perform at the Tuska Open Air 2012 festival. Suffocation, Necrophagist and Dying Fetus are among the bands that will perform at the Death Feast 2010 festival held in Hünxe, Germany on June 10-12, 2010.